What Practices Increase Infiltration and Reduce Runoff on Slopes Greater Than 30%? Why Are We Concerned About Runoff on Farms? 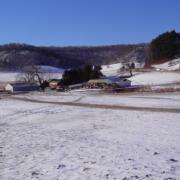 Farming in the driftless region of Wisconsin where the steep fields and waterways are all connected to rivers and streams can have signficant risks to water quality. Sediment and nutrient movement into streams, rivers, and lakes in this part of the state has always been an issue, and agriculture has been identified as the largest contributor. This talk is given by a farmer living and farming in one of the most challenging areas of the country. For seven years, the UW – Discovery Farm Program (DFP) and the United States Geological Survey (USGS) conducted a paired research project on a livestock operation in the driftless region of Wisconsin. This farm consisted of about 800 acres of tillable acres where fields are steep (some >30% slope), and every one drains into a waterway or stream which eventually flows into the Mississippi River. 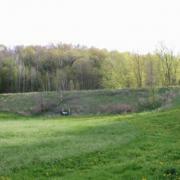 The USGS installed two in-stream monitoring stations in two small headwater streams that divide the farm. 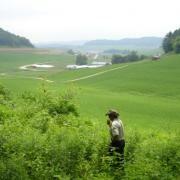 The north basin consists of 430 acres with 150 acres cropland, 250 acres woodland, and 30 acres pasture. The south basin consists of 215 acres with 39 acres cropland and pasture, 107 acres woodland, and 69 acres in CRP/CREP. The farming system uses a combination of conservation tools and techniques that have been adapted to fit the physical setting of the area, and the goals and vision of the producer who has a rich history of conservation. Harvesting precipitation is constantly at the forefront of operations through careful soil management, a network of small check dams and larger at-grade stabilization structures, and a focus on minimizing soil disturbance activities. Seven years of data indicated that almost all sediment losses occurred during a few large summer storms that exceed the design criteria. This project is completed and all that remains is the development of outreach and education materials. Information is available through the website (http://www.uwdiscoveryfarms.org) or by contacting the office at 1-715-983-5668.